And I’m not even sure it’s even possible for animals to steal their own kind and sell them off to other human beings for their own well-being, but that’s exactly what’s happening here. This issue strikes a nerve in me a bit, and the reason why I felt the need to go downtown to support & cover the happening protest was because, this could have happened anywhere, and I have a sister who’s 10, and female cousins aged 18 and down. If the tables were turned and one of them (God forbid) was involved in that situation, would I want people to show compassion to try and help? Would people actually stand up for the issue, or simply be (as a friend of mine Sandra put quite nicely) ‘Online Activists’? There are a lot of questions, but the one thing that still comes to mind at the end of it all is that we’re human, man. Simple as that. Never mind that my ancestors have African origins (damn near everyone does to some extent), and never mind that it’s happening in another country in another continent, but it’s about being empathetic to some degree. It’s funny that people who are pessimist say that because you choose to pay attention to one issue instead of many, that gives them rights to not feel philanthropic in any way, but an offer of a helping hand is better than a closed fist. I had the opportunity to speak with Monique while the protest was happening at Yonge & Dundas Square, and she brought insight to the situation, including the nature of the protest to begin with. The STiXXclusive Blog: Can you explain the situation that happened to the Nigerian girls, for those who don’t know? 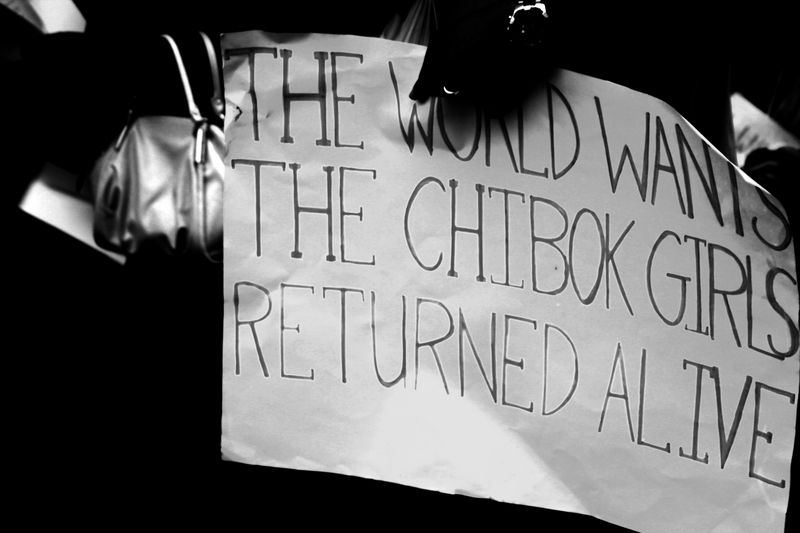 Monique: There were 234 young girls who were abducted from a boarding school [in Nigeria]. They ambushed in, took the girls, and burnt the school down, and the parents still don’t know where their kids are. The government is doing anything about it; media’s not covering the story; it’s being swept under the rug. We have to bring awareness to this matter. This can’t continue to go on. TSB: Why do you suppose the media hasn’t been paying attention to a situation that’s clearly a big deal? MBY: I do believe that the reason why this isn’t getting attention is because it happened in Africa, for one; and two – they’re young, black girls. If this was here in Toronto and one child went missing, there would be an Amber Alert. It would be on every news channel, it would be on the radio, people would be alerted through text, and they wouldn’t stop until they got that 1 child. 234 and they do nothing? This is ridiculous. TSB: How long ago were they abducted? MBY: They were abducted more than 2 and a half weeks ago, and people as of yesterday [May 2nd] are just hearing about this situation that happened in Nigeria. TSB: How did the protest come into happening? MBY: I logged onto Instagram, and there’s this person who’s very inspirational to me – Angela Dean. What happened was, she posted something saying we should do something about this situation; I texted her, and I told her I know this is going to sound like a crazy idea, but I want to do something. She told me that it’s not crazy to do it, so I started making posts; I made a flyer, and from there people started reposting on Facebook, Instagram, and tweeting it. That’s why we’re here now. TSB: It’s a great turnout, but what’s your overall goal you want to take from this protest? Monique is one of many people in the city and around the world who are steady trying to bring awareness to this situation, because it’s really insane as to what’s happening. People always say that the world is insane and has got worse, but when you just read articles, and share an update about your sympathies, it doesn’t necessarily contribute to making the world a better place – that’s if you care to make it a better place. Whether it’s thousands of miles away or in your own city borders, it doesn’t hurt to take a moment to help out. There are ways to get involved, and it’s closer to 300 girls now that have been kidnapped. It’s a crazy story that you probably haven’t heard yet, so do your part (sign the petition).